This release has primarily involved bug fixing, but one major user visible change is a rewrite of the camera control panel. Instead of showing all possible camera controls (which can imply 100’s of widgets), only 7 commonly used controls are displayed initially. Other controls can be optionally enabled at the discretion of the user and customization is remembered per camera model. Completely rewrite control panel display to show a small, user configurable subset from all the camera controls. In the time off over Christmas and the New Year I decided to investigate & learn about the creation of GNOME Shell extensions. As an amateur astronomer, I have an interest in knowing what the “seeing conditions” will be like in the forthcoming nights. There are a number of different websites which provide forecasts, as well as apps for Android and iPhone. 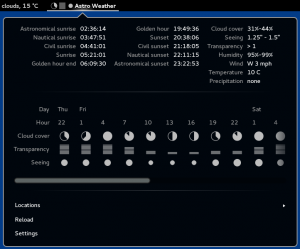 I use the Android AstroPanel application quite frequently, but most of the day I’m sitting in front of my laptop and would rather have the data presented there, alongside the regular weather forecast, rather than on my phone. 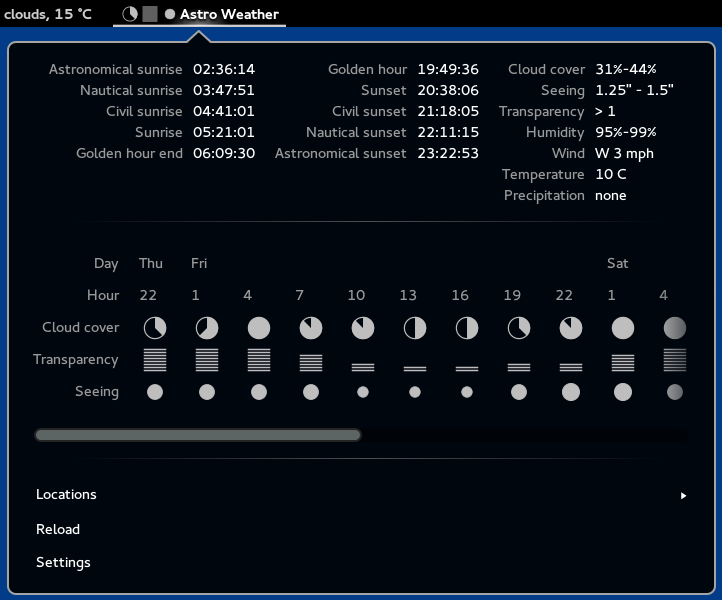 So after finding that extensions are quite simple to create, I decided to create an extension for displaying an astronomical weather forecast for GNOME Shell. As well as fixing bugs, in the future I’d like to make it possible to specify arbitrary locations with long+lat since the GWeather location database is very limited in its choices. Using some kind of GeoIP service would make it possible to just “do the right thing” for your current location. I’d also like to have it display the phase of the moon, inform you which planets will be visible overnight and list any ISS overhead passes. Finally I want to integrate with astronomical forecast data sources beyond 7Timer, since their REST API has sadly been having extended periods of downtime. Contributions from any other interested people are of course welcome, either patches via email or merge requests via gitorious. Thanks to the great work of the Fedora translation team, Entangle has > 90% translation coverage for Dutch, Polish, Ukrainian, French and Japanese and > 80% coverage for Swedish, Czech, Hungarian, Italian, Spanish, Chinese and German. If you are in a position to help translate Entangle further, consider joining the Fedora translation team. I took this to heart, creating a set of slides which consisted entirely of beautiful images I’ve taken myself overlaid with just one or two words of text. I found it quite a liberating experience to give a presentation using such a slide deck, since it freed me from having to read the slides myself or worry that I’d forgotten to talk about a particular bullet point. Hopefully those in the audience found the talk a more fluid & engaging experience as a result. After the talk, and in the days following, I had interesting discussions about Entangle with a number of other attendees, so going to LGM definitely achieved the goal of attracting more interest. At the end of the last day, we had the usual conference group photo, but Jakub Steiner then raised the bar by getting out his quad-copter with camera mounted to shoot a group video from the air. Since the very start of the project, it has always been the intention for users to be able to extend the core interface with custom plugins. Thus far though, this has been all talk, with little real action. Entangle is written using GTK/GObject with a fairly well structured object hierarchy / codebase to make it easier to understand / extend and integrates with the libpeas library for plugin infrastructure. What has been missing is proper annotations on the internal APIs to enable GObject Introspection to be able to correctly call them from non-C languages. The past few weeks I’ve been working hard to address all the warnings displayed by g-ir-scanner with the goal that all internal APIs are fully annotated with calling conventions. To actually prove that the plugin system is useful, I’ve also started work on a simple demonstration plugin. The goal of the plugin is to provide a way to turn the UI into a capture “selfie” photobox. This was inspired by the fact that a user has already used Entangle for such a system in the past. The plugin basically just hides the menu bar, toolbar and camera settings panels, adds a large “capture” button and then puts the app into fullscreen mode. Working on this helped me identify a few issues in the codebase which were making life harder than it needed to be – for example there was no easy way to get access to the GtkBuilder object associated with a window, so getting hold of individual widgets was kind of tedious. With the first cut of the plugin now written and working, it should serve as nice example code for users interested in figuring out how to write more plugins. At the top of the list for plugins I want to work on next is something to automate the shooting of an entire sequence of images. For example with astrophotography it is common to take sequences of many 100’s of images over several hours. You quickly become bored of pressing the shutter button every 30 seconds, so automation is very useful. While I’m not personally interested in using Windows on the desktop, preferring GNOME 3 and open source software exclusively, I realize that not everyone shares this viewpoint. There are plenty of people who want to continue to use Windows for whatever reasons they have, but wish to be able to use cool open source applications like LibreOffice, GIMP, Digikam. The Nikon provided software for DSLR control is not cheap, so there’s clearly an opportunity for Entangle to be useful for Windows users. The key factor from my POV is minimising the overhead / costs of maintaining the port. I don’t want to have to use Windows on a day-to-day basis for this porting work, so getting it working using Mingw64 and hopefully WINE is a pre-requisite. Entangle depends on a number of 3rd party libraries the most critical of which are of course GTK3 and libgphoto2. GTK3 is available for Minge64 in Fedora already, but libgphoto2 is not in such good shape. There is clear evidence that someone has done some amount of work porting libgphoto2 to Windows in the past, but it is unclear to me if it was ever complete, as today’s codebase certainly does not work. One evening’s hacking was enough to fix the blocking compile errors exposed when cross-compiling with Mingw64, but that left many, many 100’s of compile warnings. Even with the native Linux toolchain, libgphoto2 spews several 100 compiler warning messages, which really obscure the warnings relevant to Mingw64. So I’ve spent several more evenings cleaning up compiler warnings in libgphoto2 on Linux, resulting in a 17 patch series just submitted upstream. Now I can focus on figuring out the rest of the Mingw64 portability problems in the codebase. There’s still a way to go before Entangle will be available on Windows, but at least it looks like it will be a feasible effort overall. This release is primarily focused on bug fixes.